Dietitian Joan Breakey talks about developments since Dr. Ben Feingold, in 1973, first linked diet and hyperactivity. Robyn Williams: One of the biggest controversies of the 1970s was about hyperactivity in children, their diet and the advice of American scientist Dr Ben Feingold. So whatever happened to the Feingold diet? In Brisbane, Joan Breakey tells the tale. Joan Breakey: In 1973 Dr Ben Feingold first linked diet and hyperactivity. The Feingold diet excluded artificial colours and flavours and some preservatives, as well as aspirin and natural salicylates. In 1974, Dr Joan Woodhill, an Australian dietician, trailblazed work and produced the Australian Feingold diet. She incorporated information from dermatologists who used low salicylate diets, and excluded more fruit, all herbs and spices, essential oils, capsicum and coloured stock cubes, thereby accidentally excluding MSG. In 1975 Feingold’s book ‘Why your child is hyperactive’ was published. It produced a great controversy in USA and Australia. At that time I had begun work in Rockhampton, in a small study with psychologist Louis Salzman. I enjoyed the challenge of working with a new diet, helping families make it workable. Feingold had excluded commercial chocolate because of additives, so I instructed my families to make home-made chocolate cakes and biscuits. To my surprise, some reacted. I presumed they were ‘allergic to chocolate’. I was interested in diet content so I researched the diet aspects of work on urticaria. I didn’t ask the question ‘Why is the same diet being used for urticaria as for hyperactivity?’ for another year. I console myself now in noting that neither did anyone else at the time. Feingold’s hypothesis that diet caused hyperactivity seemed simple to test. Researchers tested on that basis, published in the late 1970s. These studies refuted the hypothesis that diet caused hyperactivity, they also reported that some children did react. However, the issue was far from simple. In hindsight those studies had limitations. No time had been allowed for withdrawal or washout. Most studies used only 26 milligrams of dye and the usual intake was later estimated to be over 100 milligrams a day. As well, artificial flavour is used in ten times the dose of colour, so the researchers testing the hypothesis had challenged with a dose that was out by a factor of 10. I reported my findings in 1977 at the International Congress of Dietetics in Sydney, to a fairly cold reception. Findings at that time included individual differences, the role of allergy overlapped. I also noted that on the diet, symptoms such as eczema decreased. In hindsight it seems obvious. Feingold was an allergist. Many of the children I saw had eczema or had had allergic symptoms in infancy. Feingold had implicated, but not emphasised perfumes. Smells of paint and petrol and felt pens were now also implicated. The second phase in the research happened over the next 10 to 15 years. When reflecting on the scientific process I realised that there was an important difference between this and the earlier research. The second group’s research grew out of clinical application of the diet in centres which treated hyperactive children. This meant that each developed the diet therapy and also broadened the symptoms they assessed. They became familiar with the issues relating to diet, and each has made a significant contribution from their particular orientation. The results of these important contributions were published between 1985 and 1995. The early research had shown that diet did not cause hyperactivity. However it had not proved that diet had no role. These several studies have now shown that there was a statistically significance change in the behaviour of some children with dietary intervention. How did they contribute to the thinking in the ‘80s and ‘90s? The UK team showed that ‘whole foods’ such as milk, wheat and eggs and chocolate were implicated. They suggested that allergy and food idiosyncrasy may coexist. Dr Anne Swain, a Sydney dietician, did a careful analysis of salicylate in Australian foods. She also researched and excluded additives, salicylate, all amines, and MSG in physical symptoms such as irritable bowel syndrome, asthma, urticaria, eczema and behaviour. This introduced the concept of ‘target organ sensitivity’ whereby one person can have diet reactions producing migraine, whilst another, hyperactivity. They suggested that the mechanism involved pharmacological idiosyncrasy, or an adverse to a food, just as people can have to a drug. A Melbourne paediatrician, Dr Cathy Rowe and her husband Kenneth, a psychologist, developed a questionnaire to be used in diet studies. They were the first researchers to report that irritability, restlessness and sleep disturbances were symptoms diet improved. In addition to what I now call ‘the usual suspects’, a Canadian team excluded caffeine, lowered sugar, and any substance the family suspect might affect their child. For example, dairy, apple or carrot. Their design included having several suspect foods all in the challenge diet. They reported that this resulted in having more behavioural change than a challenge with a single food or chemical, showing that individual difference was better managed this way. They reported that halitosis, that is, ‘bad breath’, headaches and sleep problems were the physical symptoms that changed most. They also investigated the nutritional state and found that poorly nourished children are not more susceptible. The important nutritional issues are ensuring sufficient energy, protein, iron and calcium if dairy has to be limited. By 1982 I had developed a diet outline with allowed food, ‘use occasionally’ foods, which were rarely reported to produce bad reactions and made the diet easier to manage. They included low risk fruit, and mild flavourings such as vanilla, carbo or lemon. As well there was a list of non-food items to exclude. From 1984 I was fortunate to be employed part-time in Child Guidance clinics, to provide a dietetic service to families who wished to use treatment in ADHD children. I followed up 500 families over five years. It is interesting to look back on how the diet developed over that time. Tolerance to fruit did not follow the salicylate analysis as closely as expected. Golden Delicious apples with negligible salicylate was still not well tolerated. Note that if there was a placebo effect it could have applied here. I’d advised families that the new research showed they were OK. It was with disappointment that mothers would ring and say, ‘I don’t know about others, but my child is worse since trialling the apples.’ Other findings I noticed then were that the diet needed to be much stricter in those under five; by ten, the tolerance improved and continued until the teenage hormones began. Then it decreased for a year or two and improved greatly by late teenage. I was able to make a ‘Clayton’s’ diet for teenagers or for families where implementation was difficult. Like most services for ADHD children, the Child Guidance Clinics did not note allergic symptoms. However, food problems in relation to eczema, rashes or diarrhoea were often mentioned to me and they became a factor that staff discussed and used to add weight to referral for diet therapy. Forty-three percent of the sample had allergic symptoms. They’re often super-sensitive to smells in particular; they might also report being sensitive to tastes, so they can be very fussy eaters, and to certain lights, certain noises and scratchy clothes. Families also often report them having a high body odour. So where were we by the mid 1990s in answering the question ‘What became of the Feingold Diet?’ What were the main exclusions? There were the added colours, flavour and preservatives, the natural chemicals, salicylates, amines, and natural MSG, a group of whole foods commonly implicated in allergy, for example milk, wheat, corn, soy and egg. As well there were non-food items, particularly strong smells such as perfume and paint, and contact dye on the skin from finger paint or coloured playdough. I noted more patients presenting in the allergy seasons and realised inhalants also had a role. Stress and infections were also implicated in some. This adds weight to the old idea of ‘What’s got into him? Has he got worms or something?’ Remember, there are two phases to elimination diet management. There are the initial exclusions and then challenges, or a reintroduction phase that can go on for months as various foods are tried. Sometimes I get criticised for having patients who are probably food phobic, but I assure you these are rare. Most families want to reintroduce as much as possible. The newer exclusions were not just the whim of some researcher, they were found by families being well established on the diet with symptoms controlled coming in contact with something new, such as a child coming home from preschool covered in dye from finger paint, a relation visiting while wearing strong perfume, or after significant stress, such as a car accident. Wow! Now it’s getting complicated. There was an important question to consider. Why, if all the researchers had their own particular variation on the diet, did they all reach statistical significance? The answer includes two concepts. One is that they needed to corporate the individual differences in what particular children reacted to. The second is that because there’s a pharmacological component to the reactions, the total load of suspect substances and the dose of each is important. If any researcher lowered what I now call the total body load of suspect substances far enough, and then challenged with sufficient dose of dye or with more than one suspect substance, the results would reach statistical significance. The researchers who were assessing the diet and then researching it can be contrasted with, for example, one UK researcher who excluded only tartrazine and benzoate in his test diet, and challenged with dye in orange juice. It is such a shame that someone could go to so much trouble using double blind placebo controlled methodology without ensuring the test diet was at least as strict as the one Feingold used. There is another side to the question of the Feingold diet, and that is, What exactly does diet change? Is it hyperactivity? The answer is No, in the sense that there are several symptoms that change more. Irritable, touchy or crank, changed most. Then came Difficult to reason and communicate with (being off with the fairies). However it is important to note that the core features of attention deficit hyperactivity disorder, poor concentration, impulsivity and restlessness came next in degree of change. In addition to these, arguing, being excitable, not persevering, being unhappy, easily frustrated, things like unco-operative, aggressive and difficult to control, all changed more than hyperactivity itself. So we have a diet decrease in three main areas. The first is the ADHD and ADD problems, the second is the mood problems, and the third is physical allergic-type symptoms. I am saying that diet can be an aggravating factor in all these conditions. Diet does not help with these problems in everyone. This raises the next important question: Just who is susceptible? The best indicator is family history. Note that, along with hay fever, eczema and other allergic symptoms, headache, migraine and irritable bowel syndrome occur in food sensitive families. I continue to be amazed how many of these types of symptoms are present in the family’s histories. Another indicator is if parents can give an example of seeing symptoms becoming noticeably worse, usually in early childhood, after some particular foods, such as after chocolate at Easter. There is definitely something causing reactions, and salicylate sensitivity is supposed to be rare. However it was present in 10% of my initial research group. After years of explaining natural and added chemical exclusions I noted that there was a common factor: it’s flavour, artificial flavour, natural flavours in herbs and spices, peppermint, teas, tomato, tangy fruit, chocolate, aged foods, and of course flavour enhancers. These are all the things we add to food to ‘give it a lift’. Food sensitive people do not tolerate these additions. So after 25 years of research, how do we answer the question What’s become of the Feingold diet? We now have a fair idea of the foods to investigate. The diet has become a process of elimination of suspect substances with challenge and reintroduction to provide an individual diet. The diet can be used more or less strictly, depending on the total body load of suspect substances and environmental factors. We have a fair idea of symptoms to investigate, and we have a fair idea of the susceptible group. 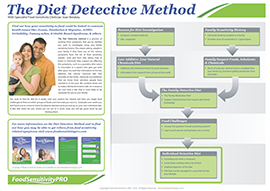 Dietary investigation should be considered as part of the treatment options in ADHD children. We are at the beginning of another 25 years of interesting research. Next week, Professor John Carmody asks whether Australia needs to be a Drongo Culture, or could we really become a Knowledge Nation. I’m Robyn Williams.